Father's Day is just around the corner, and I'm already thinking about it. I usually am pretty much a slacker when it comes to celebrating Father's Day, and I feel pretty bad for my husband. So this year, I'm starting to think about it early, in hopes of making it a bit more special for him. 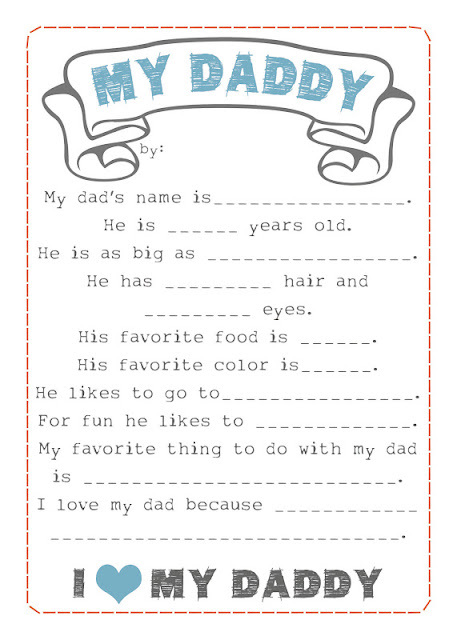 I decided that I wanted the kids (well mostly my oldest) to fill out a questionnaire about Daddy. I could have printed a preexisting one, but instead I decided to design one myself. It prints as a 5x7 and would look really cute framed up for Dad. If you have any questions or need assistance, feel free to email me! I can't wait to see what the kids answers are, and I hope their Daddy gets a little chuckle out of it as well. Thanks for sharing, Kinz! I am going to print it right now! Love this! For the past 3 years, I've been taking photos of our little ones under the same tree and keeping it in a scrapbook. This Daddy sheet is the perfect thing to go along with it. Thanks for sharing!! I'm going to do this with my 4 year old twins and save a copy for the upcoming years. I think it will be neat to see how their responses change each year! I used this print out in my sunbeams class yesterday. The answers were priceless. I'm reposting this link on my blog. Oh boo...i had the same problem as anonymous up there. Any ideas on how to get it working? I can't get it to print either, anyone know how to get it to print. It is really a cute idea would love to print it. Right click the image to open in a new tab and then do control+P to print. The image will not be full page but at least you don't have to sign up for anything the download it. I wasn't able to access the download, the site was blocked, but I copied the picture and pasted it into PowerPoint. The image in the post is the full 5x7 size. Thank you. We are going to frame it for dad! Mine printed fine - but I printed it from pinterest. Thanks for this - I got my two year old to answer the questions and it turned out sweet and hilarious! What a great idea! I will be doing this with my 5-year-old, thank you :) Pinning it now! thanks for sharing, my hubby will love this from his littles! Love this! Do you have one for mommy? Would make a good mothers day gift also. This is so cute. I can hardly wait to hear my children's answers! Thank you for posting this!! Very cute, thank you for sharing! I can't wait to see what my daughter's answers will be! Bummer the google drive isn't working though. I printed this on 5x7 card stock and it turns our a little grainy due to downloading the low res image from the website (rather than the high resolution download that is likely on google drive). Just an FYI. It is VERY cute regardless and I am SURE Dad will love reading the answers. Thank you!!! Thanks so much for the comments that helped with printing! I loved this printable and didn't want to miss out. Right-clicking and saving as a photo worked for me :). Thanks for making this Kenzie! So fun! Thanks so much for sharing! Thank you SO much! I printed out two of them for my granddaughters to give to their daddies. This is so perfect and so sweet! Thanks for making this. My husband will love this. My son (3yo) said Daddy is 3 inches tall. Haha. please do not copy, share, or post any of my pictures or text without my permission. if you want to, just email me for permission first. thanks.